In recent years, several machine manufacturers launched machines under the category Micro. When you look closer it is evident that the meaning of Micro differs greatly between manufacturers. For many, it is simply a smaller machine. For Water Jet Sweden a Micro machine is primarily designed to manufacture micro components with very high precision. At the same time, there are other options if you need to process small items or make narrow cuts. 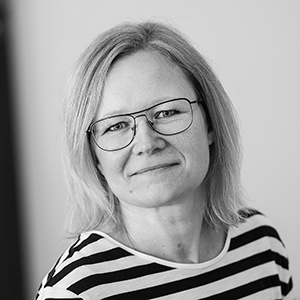 The meaning of Micro varies, so now we untangle the differences and describe how Water Jet Sweden has chosen to look at it. The Micro machine (NCM 10 Micro) is a high precision tool cutting with narrow incision (≥ 0.2 mm) to manufacture micro components. Maximum table area is 1 x 1 metres even though a smaller area often is used. The machine is based on FAWJ process (Fine Abrasive Water Jet cutting) and has a number of unique design features to provide extremely high precision (± 0.01 mm/300 mm). The tableframe is integrated with the machine construction and motion system as one complete unit for keeping high precision. The tableframe is made of Mineral Casting Bearlit, a composite material that is rigid, anti-vibration and withstands temperature fluctuations. Micro parts often require advanced fixtures. 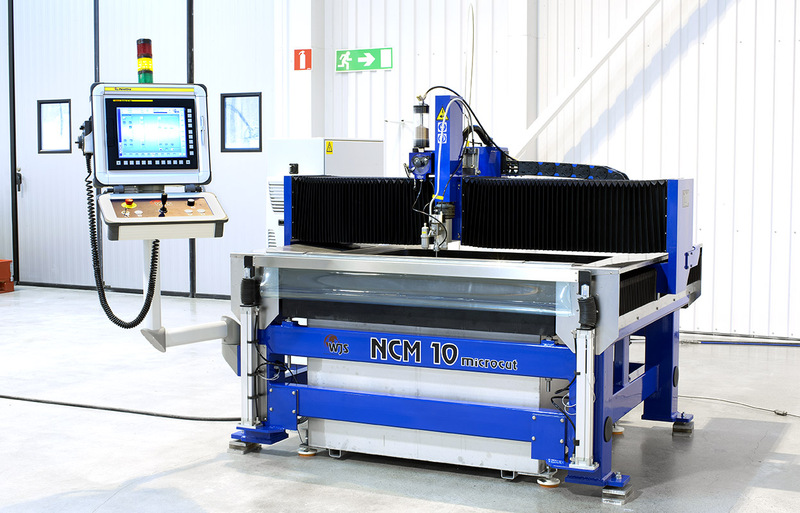 Therefore NCM 10 Micro has a palletized cutting table with unique opportunities for fixture arrangements. The cutting table is fixed into the tableframe with a free standing water catcher to keep high precision. The stainless steel water catcher is rubber suspended to avoid vibrations and thermal influence. X/Y motion axes are fitted with Renishaw Invar Scale, a micrometer scale with extremely low expansion coefficient and high resolution. The cutting head, WJS Micro Cutting Tool, is specially designed for the FAWJ cutting process. It is a precision tool for creating the most accurate water jet cutting in the world. NCM 10 Micro provides all the advantages of abrasive water jet cutting (cold process) and covers the gap between the EDM and Micro Laser. NCM 10 Micro is common in industrial sectors such as electronics, medicine, biotechnology and precision engineering. The Micro Cutting Head offers an incision down to 0.2 mm, compared to traditional waterjet cutting that normally has 0.7-1.1 mm incision. In addition to processing of fine parts, the FAWJ technology is sometimes used when processing valuable materials such as precious metals and special alloys, since narrow incisions offers less material loss. Exept for the Micro machine model the Micro Cutting Head itself is available as a cutting tool for X-series machines (NCX) and Premium machines (NCP). NCX and NCP both have the kind of CNC control system and size of cutting tables that has the ability to handle the delicate abrasive feeding of the FAWJ process. FAWJ requires a software-controlled abrasive feeding. The software control the feed rate, sense critical levels in the abrasive buffer and quickly detects blockage. When the Micro Cutting Head is applied on NCH or NCX a minimum 0.3 mm focusing tube is recommended compared to ≥ 0.2 mm on the Micro-machine. 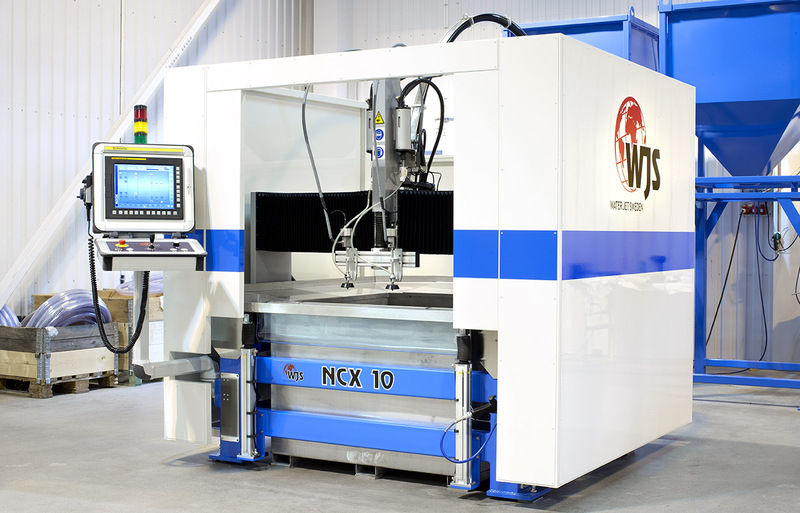 If there is a need for just a small machine and small cutting area, and the incisions and accuracy of traditional abrasive waterjet cutting is sufficient, the two other machine models than the NCM become the natural choice: H-model (NCH) or X-series (NCX). The Premium, NCP, mentioned above is not available as a 1 x 1 meter machine. 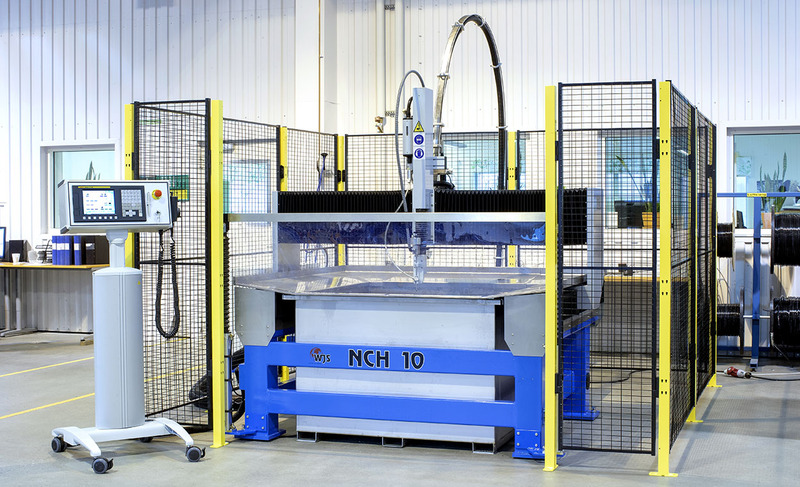 H-model (NCH) is an entry-level machine system and a complete workstation for all types of water jet cutting in 2D. Compared to it’s predecessor X-series it has some less optional features but it still delivers the same high quality cutting. It is designed with similar advanced technologies and with the world patented gantry design that provides a high quality, long life cutting performance. H-model is available in sizes 1 x 1 m, 2 x 1 meter and 3 x 1.5 metres. X-series (NCX) belongs to the category Select Machines which means that it has a few more optional features and tools, and the machine is operated by the PanelOne ® operator system. X-series is a high performance water cutting machine for any kind of 2D cutting. It is available in five sizes from 1 x 1 meter to 4 x 2 metres. Both NCH and NCX are equipped with a single Z-axis. Multiple cutting heads for pure water jet cutting (PWJ), or an extra cutting head for abrasive water jet (AWJ), can be mounted to get increased cutting capacity. When using the wide market definition of Micro machines, Water Jet Sweden offers three different types of “micro” systems: NCM 10, NCH 10 and NCX 10. All three machines are based on a small cutting table of 1 x 1 metres. Wich model is the best for each particular application depends on the requirements for tolerances level and incision width, summarized in the table below. The Micro machine (NCM 10 Micro) is specially designed for machining of micro components. A H-model 1 x 1 meter machine (NCH 10), standard equipped with screen guards and Fanuc 8.5 “Touch Screen operator panel. X-series 1 x 1 meter (NCX 10) with PanelOne ® operator’s panel. This with built-in protective walls.